Peterborough Phantoms players and officials with their three trophies. Photo: �2018 Tom Scott. All rights reserved. Head coach Slava Koulikov hailed the ‘amazing’ exploits of Peterborough Phantoms after they completed an honours treble last night (April 7). The city men added the NIHL Division One South play-offs final prize to their NIHL Autumn Cup and NIHL South Cup crowns with a 13-8 aggregate triumph against Bracknell Bees. They triumphed 6-4 in Bretton to follow up a 7-4 success in the opening leg 24 hours earlier. Phantoms Tom Norton celebrates a goal against Bracknell. Photo: �2018 Tom Scott. All rights reserved. But no sooner had the celebrations died down on another memorable night at Planet Ice than Koulikov shifted his focus onto claiming yet more silverware in the NIHL Final Four this weekend. “Winning a trophy is a huge achievement for any club, winning two is even better and winning three is just amazing,” said Koulikov. 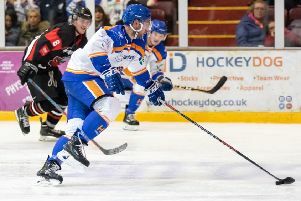 “We had to get past MK Thunder and Basingstoke to reach the final of the play-offs and then we had to come through two tough games against Bracknell. “We have produced some great hockey throughout this season and we have the trophies to show for it. PHantoms star Martins Susters fires another shot at the Bracknell net. Photo: �2018 Tom Scott. All rights reserved. “To be able to win all three of them on home ice is even more satisfying and it has been great to be able to celebrate with the fans on each occasion. “They have given us great support all season and they were definitely the sixth man for us again last night by creating such a great atmosphere. “Not many people thought we would be competing to win trophies in the way we have done this season, but we have once again found ways of competing against and beating the best teams in the league. “But there is still one big weekend to go and one more massive piece of silverware that we want to try to win. Koulikov singled out forward star Martins Susters and netminder Jordan Marr for special praise in the wake of the play-offs triumph. Susters scored four and made two of the club’s six goals during the second leg against the Bees while Marr produced stunning performances in both legs. “Martins is an amazing player and we were very lucky to be able to bring him back to the club,” added Koulikov. “He won the second leg almost single-handedly and to score four goals in a play-offs final is something he’ll never forget. “But it was another night and indeed a weekend where every single guy played their part. “We always build a team from the back and we have a netminder in Jordan who always plays well in the big games. “He made key saves at important times on both nights, the ‘D’ guys managed the puck really well and the forwards created good scoring opportunities. Phantoms will face NIHL Division One North play-offs runners-up Sheffield at the semi-final stage of the NIHL Final Four on Saturday (April 13). The city men overcame the Steeldogs earlier in the season to lift the NIHL Autumn Cup. North champions Hull – who beat Sheffield 13-9 on aggregate at the weekend – will meet Bracknell in the other semi with the two winning sides progressing to the Sunday (April 14) final.